Teresa Sue Menzel Edgecomb, 52, residing in Riverview FL, passed away after a hard fought battle with lung cancer on Friday, January 11, 2019, at Brandon Hospital. She was born on April 10, 1966, in Fairbanks, Alaska to her father, Donald Eugene Menzel (deceased) and her mother, Nobuko Terukina Menzel. She was a 1984 graduate of Tampa Bay Technical School, and was head and co-head cheerleader during her high school career, graduating with Honors. She married Brian Edgecomb of Brandon, FL in 1995, and their beautiful daughter, Terra, was born in 1999. Terra graduated from Riverview High School and is currently attending Santa Fe College in Gainesville, Florida. Teresa had a long career in the insurance industry. Her career and personal life exemplified her incessant positive attitude and love for others. Her beauty radiated from the inside out, always showing compassion to those around her. She loved spending time with friends and family; building strong connections with her infectious smile and contagious laughter. Teresa never met a stranger and spent hours in deep conversations demonstrating her genuine warmth and caring; giving her the uncanny ability to easily connect with others. She was always willing to help others, even when her health didn't allow it. If you met her once, you remembered her for a lifetime. She is beloved by many and will be deeply missed. She is survived by her husband, Brian Edgecomb; beloved daughter, Terra Edgecomb; mother, Nobuko Menzel; sisters, Jeannie Kenyon (David) and Debbie Fisher (Bill); brother, Dennis “Denny” Menzel; nieces, Salena McKinney (Shawn) and Brandi Mason; nephews, Christopher Fisher and Thomas Fisher; great-nephew, Andrew Mason; great-niece, Gwendolyn McKinney and extended family in Montana. Teresa was a believer in Christ and her faith in him was very strong! Teresa was a blessing to so many, a treasure to even more, and loved beyond words. She will be missed beyond measure! The family would like to extend a special thank you to ‘Team Teresa’ for all their help, support, care, and most importantly love. We couldn’t have done it without you. Family, friends, and others who were touched by Teresa’s life are invited to attend her funeral at First Baptist Church of Brandon located at 216 N. Parsons Ave., Brandon, FL 33510 on Saturday, January 26, 2019. The viewing will be from 10:00 a.m. until 11:00 a.m. The service will begin at 11:00 a.m., with the graveside service immediately following at the Bloomingdale Community Cemetery. Pallbearers: Ralph Boyce, III, Christopher Fisher, Thomas Fisher, Andrew Mason, Michael Moore, Joshua Slatton. 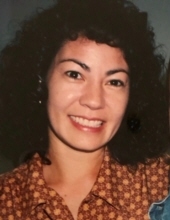 In lieu of flowers, the family requests donations be made in her honor to Prelude to a Cure (https://preludetoacure.com/donate) for Lung Cancer Research or Help Fight RA (Rheumatoid Arthritis) (https://www.helpfightra.org/donations). To send flowers or a remembrance gift to the family of Teresa Menzel Edgecomb, please visit our Tribute Store. "Email Address" would like to share the life celebration of Teresa Menzel Edgecomb. Click on the "link" to go to share a favorite memory or leave a condolence message for the family.